I’ve always used the Canon DSLR I bought in 2008 for all photos and video so it was time for an upgrade. 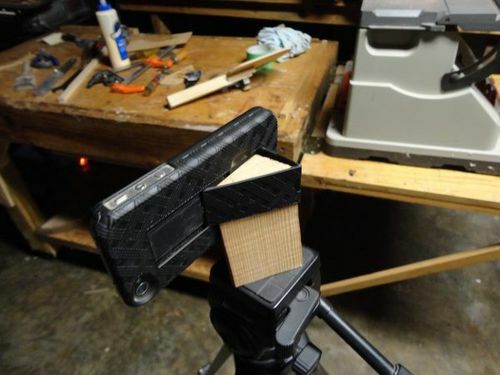 Rather than buy a new camera for just video since the DSLR still does wonderfully, I decided to make a wooden mount to hold my iPhone 5S and begin using it to shoot my videos in HD. Hey Jeff, funny you should post this because I had the same idea and decided I needed a way to mount my iphone to a tripod. So just last night I went down to the shop thinking it was going to be a complicated issue. 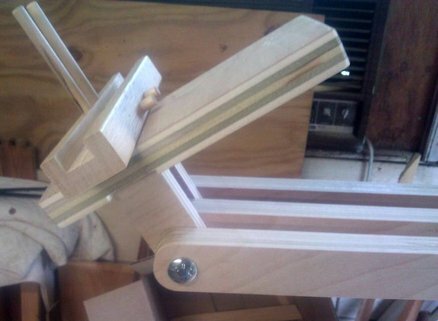 Then I realized my case had a fold out stand so I just cut a triangular block of wood, drilled hole and mounted my nut just like you did and came up with this. Took 30 minutes. I still need to sand and paint it. Not trying to upstage you. and it would only work with this particular type of case. Couldn’t believe how quick and easy it was. The first mount I made many months ago involved a piece of baltic birch that I cut a dado in for all three sides for the phone to slide down into and another piece that screwed into the end grain of the ply. That failed miserably! The end-grain quickly worn out, the microphone was muffled, and about 1/4” of the screen was showing the side piece of ply so I had to crop it out. I tossed it out recently and was so disgusted, I didn’t even bother with saving four screws that were in it! yea I believe in keeping it simple and basic and don’t over complicate things. That was the first style I considered for a cell phone mount but chose a simpler version that uses a rubberband, quicker on and off. Nice work though. I tried the rubber band idea along with the extra-small bungee cord that comes in the Harbor Freight assortment container but neither would hold it on the mount if I tipped the tripod over. I’m so excited to start filming in HD…no more 640×480 for me! Have you chosen a video editing software? I’m in the process of doing that now and trying to decide between Sony Movie Studio, Cyberlink Director, and Corel Video Studio. So far they are all about equal in that some do things easier than others yet all have their aggravations. I have seen videos made on smart phones and most of them are very decent! I hope to see some good woodworking videos soon! I’ve owned a few video cameras over the years and it seems the moment I buy one it becomes obsolete. We had a decent Sony and my wife took it work, then when I wanted to use it she had given it away because we never used it. I said we never used it because you took it to work! So for the time being I’m sticking with my cell phone. I’m using Premiere but it’s overkill for what I’m doing. I might switch to something simpler down the road but it does a great job at using my CPU’s full capability to encode (Intel Xeon). Some of the cheaper ones won’t use all the extra horsepower available. Yeah Premiere isn’t worth $50/month to me, way overkill.